FRANKFORT – Surrounded by dignitaries, including Israel’s ambassador to the United States, Gov. Matt Bevin signed an anti-BDS executive order on Thursday, November 15, making Kentucky the latest state to refuse to do business with contractors that boycott the Jewish state. Bevin also called on the legislature to make his order “permanent” by passing anti-BDS legislation in the next session. “I don’t know why we could not and should not get this done, and I’m confident that we will,” Bevin said at a signing ceremony in the rotunda of the Capitol. State Rep. Tim Moore (R-Harden), who has introduced such legislation in the past, promised to do so again in 2019. BDS, which stands for Boycott Divestment Sanctions, is a global effort to isolate Israel financially, culturally, academically and by other means, ostensibly because Israel occupies the West Bank and controls access to Gaza. Its opponents say it is really a veiled effort to weaken and destroy the Jewish state. BDS proponents try pressuring governments, universities and other institutions to divest their holdings in Israel, to prevent professionals from working abroad, and even to stop performers from including Israel on their concert tours. The new order prohibits governmental bodies from dealing with a contractor engaged in a boycott and requires them to state that they are not doing so and will not be for the term of the agreement. State agencies may also terminate existing agreements if a contractor is found to be part of a boycott. The order applies only to “executive branch agencies” and not to the entire state, according to Elizabeth Kuhn, the governor’s communications director. Benjamin Netanyahu on his recent trip to Israel. Seconds before or after the photo was taken, Bevin said, the prime minster encouraged him to take up the anti-BDS issue. “This is a powerful statement that’s being made,” he said. In cyber technology alone, he said, Israel accounts for 20 percent of global investment. Also speaking at the ceremony were Matt Goldberg, director of the Jewish Community Relations Council; David Wicker, congressional liaison for Christians United For Israel; and Judith Varnai Shorer, Israel’s consul general in Atlanta, spoke at the ceremony. 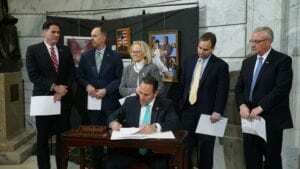 Kentucky is the 26th state to enact some form of an anti-BDS law or executive order. Minnesota, Kansas, North Carolina, Maryland, Wisconsin and Louisiana. The vast majority of those states have ant-BDS laws as opposed to executive orders, said Stephanie Hausner, deputy director of the Israel Action Network. No state has passed a pro-BDS measure, Hausner said. There have been efforts to get American universities to divest funds, she added, but none have succeeded.